Area: 4110 sq. km. out of which 1700 sq km area is occupied by rivers, canals and creeks. Temperature : In summer 37 – 42°C and in winter 9 – 29°C. 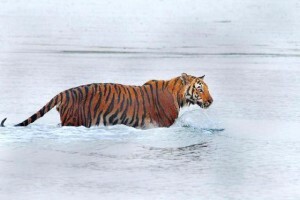 Best Season: The best season to visit Sundarban is between November and February. During monsoon rainfall is quite heavy which last from mid June to mid September. Between September to March the maximum migratory birds are also present here. Sundarbans are the paradise of lovers of Nature and Eco-tourism. It is the world’s largest Mangrove forests. 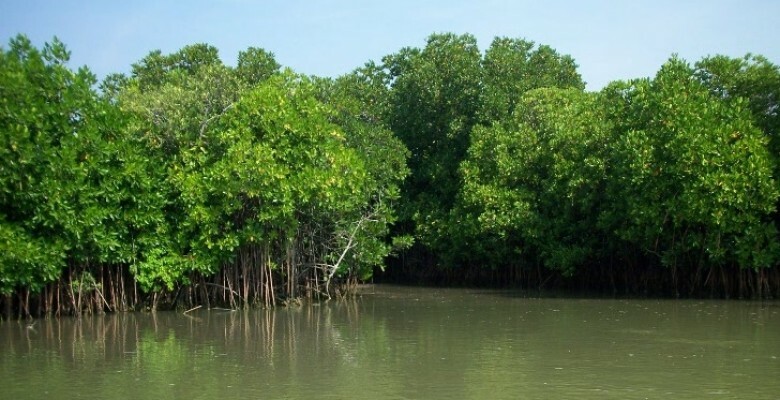 Owing its name to sundari trees, the mangroves forests consist of genwa, dhundal,. Garan, passur, garjan and kankra among a variety of other trees, which can thrive in the saline water. Sunderbans is world famous for the home of Royal Bengal Tigers. Among the world, Sundarban providing home to the largest number of tigers, are also home to a variety of fauna including the largest deltaic crocodiles, dolphins, the king cobra, lizards, pythons, olive ridley, checkered killback, gangetic gharial giant turtle and deer;and a variety of resident and migratory birds including heron, egret, cormorant, fishing eagle, seagull, kingfisher, whimprel, black-tailed godwit, little sting, easter knot, curlew, sandpiper, golder plover, pintall and whistling teal. Situated on the lower end of the Gangetic West Bengal,the Sunderbans comprise of a land of 54 tiny islands, cris-crossed by innumerable tributaries and branches of River Ganga and creeks and backwaters all over. The whole area is now the abode of the varied flora, fauna and human population. 70% of the area of 9639 sq. km. being under saline water, it makes the life of the commons, mostly honey-seekers, prawn and crab-catchers and fishermen,very difficult. Among the places that a tourist must visit are the Project Tiger, Sudhanyakhali, Netidhopani, Lothian Island Bird Sanctuary, Mayadwip, Kalasdwip, Bhagatpur crocodile Project, Piyali and Kaikhali. Sundarban declared as a Biosphere Reserve(World Heritage Site) by UNESCO in 1997, the Sunderbans provide one of the rarest opportunities to have an intense feeling of animal-loving, bird-watching, nature-loving and being lost in the midst of forest and backwater everywhere. Sundarban is only access by boat. Tourists must take a permit from West Bengal tourist centre(2/3 BBD Bagh East near the post office) in Kolkata. Air: Kolkata airport is the nearest airport of Sundarban. The distance is only 112km.From there you can go to Sundarban by bus or taxi. Train: Canning station(48km) is the nearest railhead to go Sundarban. Canning station is well connected to Sealdah and Howrah in Kolkata. Bus: Road transport corporation buses are available to go Sundarban from many cities of West Bengal. This entry was posted in Sunderban National Park, West Bengal, WildLife. Bookmark the permalink.